A transboundary waterway is defined as all territory which contributes to a stream, at least one of the tributaries of which crosses a boundary. Almost half the Earth's land surface, excluding Antarctica, and 60 percent of the world's fresh water, falls within these basins. * What this means in human terms is that most of the world's water is shared water; consequently, because all waters in these basins are connected, political arrangements are necessary for the nations which share them (i.e., coriparian nations) in order to manage them efficiently. Considerations in transboundary water treaties, their potential benefits, and some barriers to treaty development are addressed below. The UN Convention on the Non-Navigational Uses of International Watercourses was adopted in 1997 by the UN General Assembly. The UN Convention codifies many of the principles deemed essential by the international community for the management of shared water resources, such as equitable and reasonable utilization of waters with specific attention to vital human needs; protection of the aquatic environment; and the promotion of cooperative management mechanisms. The document also incorporates provisions concerning data and information exchange and mechanisms for conflict resolution. Once ratified, the Convention will provide a legally binding framework, at least on its signatories, for managing international watercourses. Even without ratification, its guidelines are being increasingly invoked in international forums. Approval of the UN Convention, however, does not resolve entirely the many legal questions concerning the management of transboundary waters. First, the Convention would technically be binding only on those nations that sign and ratify it. As of 2002, twelve countries have consented to be bound by the Convention. However, to bring the document into force, thirty-five instruments of ratification, acceptance, accession, and approval are needed. Second, international law guides conduct only between sovereign nations, and would not address the grievances of political or ethnic units within nations. Third, while the Convention offers general guidance to coriparian states, its vague and occasionally contradictory language can result in varied, and indeed conflictive, interpretations of the principles contained therein. Finally, there is no practical enforcement mechanism to back up the Convention's guidance. The International Court of Justice, for example, hears cases only with the consent of the parties involved and only on very specific legal points. Moreover, in its 55-year history (since 1946), the Court has decided only one case pertinent to international waters: that of the Gabçikovo Dam on the Danube River between Hungary and Slovakia. In 1997, the Court ruled that an agreement to build the project was binding, despite Hungary's reticence to move forward. Although the two nations were to agree on the future of the dam complex by March 1998, the dispute had yet to be resolved as of 2002. Completion of the dam system would alter the boundaries between the two nations, as established under the 1920 Treaty of Trianon. 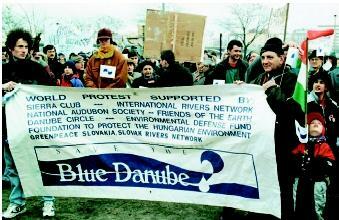 About one thousand people in Budapest, Hungary protest a planned hydroelectric dam on the Danube River in 1998, when an International Court of Justice had called for an agreement between Hungary and Slovakia. The dam was conceived as a joint project between the two nations in 1977. Although Hungary pulled out of the project in 1997, it was reconsidering as of 2002. In contrast with the naturally vague and occasionally contradictory global declarations and principles, the local and regional institutions developed by coriparian nations have focused on specific, basin-level conditions and concerns. The Food and Agriculture Organization of the United Nations has identified more than 3,600 treaties relating to international water resources dating from 805 to 1984, the majority of which relate to some aspect of navigation. Since the 1950s, more than two hundred agreements have been developed that address nonnavigational issues of water management, including flood control, hydropower projects, or allocations for consumptive or nonconsumptive uses in international basins. Yet a review of the numerous agreements from the last half century reveals a general lack of robustness. Water allocation, for example, is the most conflictive issue area between coriparian states, yet it is seldom clearly delineated in water accords. Moreover, in agreements that do specify quantities, allocations are often in fixed amounts to riparian nations, thus ignoring hydrologic variation and changing values and needs. Likewise, water quality provisions historically have played only a minor role in coriparian agreements. Monitoring, enforcement, and conflict resolution mechanisms are also absent in a large percentage of the treaties. Finally, only in the exception do transboundary water agreements include all riparian nations, precluding the integrated basin management advocated by the international community. Over the 1990s, more than fifty new bilateral and multilateral water agreements, governing basins in Asia, Africa, Europe, the Middle East, North America, and South America were concluded. A review of these recent treaties also reveals some encouraging developments. First, provisions concerning information exchange, monitoring and evaluation, and conflict resolution are included in many treaties of the past decade. Second, a growing percentage of treaties address some aspect of water quality management in international rivers. Third, a number of agreements establish joint water commissions with decision-making and/or enforcement powers, a significant departure from the traditional advisory standing of basin commissions. Finally, country participation in basin-level accords appears to be expanding. Although full basin participation is still uncommon, a growing proportion of treaties are multilateral, and thus involve a larger number of affected states, and some treaties even reference the rights and interests of nonsignatory states. Institutional vulnerabilities still exist, however, in a number of key areas. Few treaties, for example, possess the flexibility to handle changes in the hydrologic regime or in regional values. Additionally, references to water quality, monitoring and evaluation, and conflict resolution mechanisms, while growing in numbers, often are weak in actual substance. Finally, enforcement measures and public participation, two elements that can greatly enhance the resiliency of institutions, are largely overlooked. SEE ALSO Conflicts and Water ; Hydropolitics ; Hydrosolidarity ; International Cooperation ; Law, International Water ; Public Participation ; Rivers, Major World. Teclaff, L. A. The River Basin in History and Law. The Hague: Martinus Nijhoff, 1967. Wouters, Patricia, ed. Codification and Progressive Development of International Water Law: The Work of the International Law Commission of the United Nations. The Hague: Kluwer, 1998. Transboundary Freshwater Dispute Database. Oregon State University. <http://www.transboundarywaters.orst.edu> . The International Joint Commission (IJC) is a working group established under the 1909 Boundary Waters Treaty between the United States and Canada in recognition of cross-border water linkages. The IJC assists the U.S. and Canadian governments in finding solutions to transboundary water problems. Its tasks include conducting resource assessments and formulating management recommendations; evaluating and supervising water resource projects; and preventing and resolving resource disputes. Although the IJC deals with several transboundary water resource systems, much of its work is focused on water quality and water levels in the Great Lakes, especially principles established under the Great Lakes Water Quality Agreement of 1972. * See "Hydropolitics" for a map of the world's 261 international basins. I m from Nepal. Here is a transboundry water treaty on gandak river mostly that is in the favour of india and local people on nepal side are affected by flood. There was not public participation in project planning and implimantation so about 150000 people are affecting from it so please would u suggest me what can we do on the publics welfare and how can we insure their rights? what are the international law about it? Dear /madam in Africa there was not in any Water Treaties do you this G-8 countries they think about rich people only? why? but we will solve the problems we us those who are living in poor country.